Plans to cope with Mutley Plain works announced. From Monday 22th March, major road works will be taking place on Mutley Plain. This will involve the closure of the southbound side of Mutley Plain. These works are expected to take approximately 6 weeks to complete. Whilst we will attempt to run all services as advertised, please be aware that due to the nature and location of the works, and the major increase of traffic to other roads around the City, it is very likely that we will experience long delays and late running to most of our services around the city. 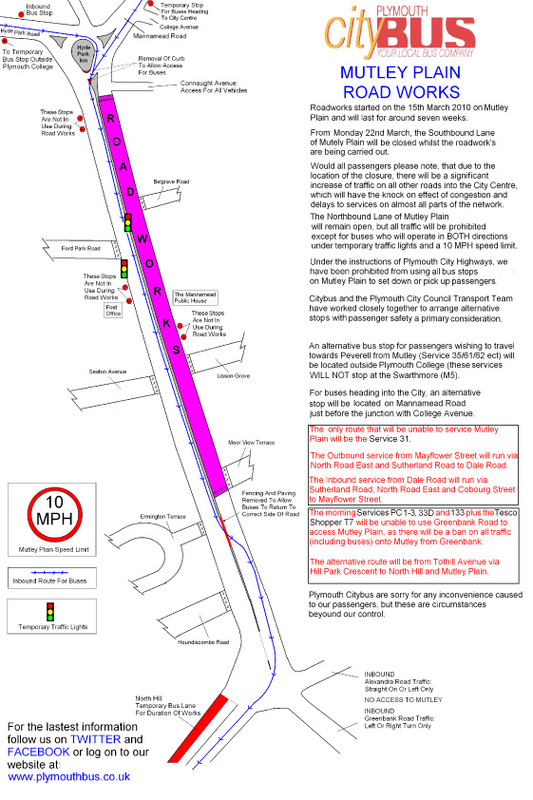 Access for buses only will be allowed onto Mutley Plain, with plans to use the northbound side for buses to run in both directions under temporary lights and a 10 MPH speed limit. Alternative stops will be located as follows: For services that would normally use the Swarthmore stops M4 – M5 e.g. services 35/61/62 etc heading towards Peverell, an alternative stop will be placed on Hyde Park Road outside Plymouth College. For services heading towards Mutley/City Centre a temporary bus stop will be placed on Mannamead Road just before the junction of College Avenue. Please see the attached map for the location of the stops during the closure. Mutley Plain gasworks affecting services from 22nd March - 25th April 2010 For 4 weeks the southbound Mutley Plain carriageway will be closed to all traffic (24 hours a day, 7 days a week) and the northbound carriageway only open to buses. All First services travelling into and out of the city will use the northbound carriageway with temporary lights at certain points helping the traffic flow. During the works the bus stops on Mutley Plain will not be served. The nearest bus stops in use will be at the bottom of Mannamead Road and on North Hill. The only exception is service 81C which will not serve Mutley Plain and will be diverted from the city centre via Cobourg Street, Saltash Road, Alma Road & Outland Road resuming its normal route from Peverell Corner (and vice versa). We apologise for any inconvenience caused due to circumstances very much beyond our control. For further information on these gasworks please contact Plymouth City Council on 01752 668000. Nothing yet on the Target Travel web site - I can see the 39 service being affected the most though. Transport of Delight: Arriva Takeover? Plymouth Local History: Tarmac - fascinating post! 16:07 he closure of Mutley Plain starts at 2330 on Sunday 21st March 2010 and may last for up to six weeks. We encourage all of our customers to allow extra time for their journey where possible. Due to the volume of traffic being forced to seek other routes we expect delays on many services even those that do not use Mutley Plain.